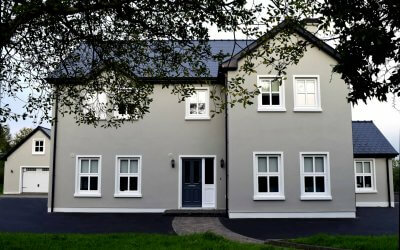 Experienced, reliable builders delivering quality work and craftsmanship to private individuals and businesses in Donegal and the North West – on budget & on time. If you need a complete transformation of your existing property you can trust Micheal Gallagher to deliver the highest standard of work. Want that extra bedroom, conservatory or garage? Just give us a call to discuss your project – we’ll guide and advise you through the process. Our team includes skilled builders, painters, electricians, tilers and plumbers so we can keep your building, home or commercial property maintained to the highest standards. Thinking of building a new home or office? 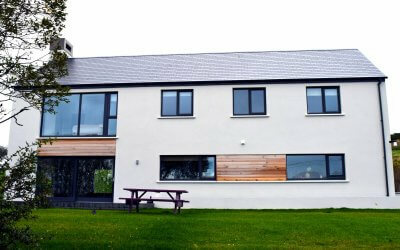 Working with one of our partner architects in Donegal we can provide a complete building service to meet your budget and deadline expectations. Whether you’re looking to build the home of your dreams – or you just need a new garage or loft conversion, we can deliver a cost effective solution with the minimum of fuss. Whether you choose to work directly with us, or through an architect – we’ll use our extensive experience to advise on the right materials that combine aesthetics and functionality. Our work speaks for itself and we encourage any of our potential clients to look at examples of our projects. With a proven track record, we have a reputation for quality workmanship and delivering on time even in the face of the most stringent deadlines. Our network of suppliers – local, national and international means we keep up to date with the latest materials and build techniques too. 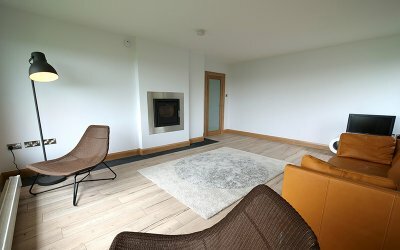 A complete renovation project on a holiday home that had been built in the early 1970's transforming it into a much more contemporary and comfortable living space. The owners wanted the materials & design to reflect the coastal location so this informed our choice of materials and the overall design. An extensive five bedroom modern house & garage build project. The project included new roof with skylights and loft accommodation and associated landscaping work. A high quality finish throughout using the latest energy efficient building materials and techniques. This family home was built with a contemporary style in mind - with external wooden cladding and an extensive, easy to maintain decking area lending a modern but practical implementation to the build choices. Glazing and roofing materials were elected to withstand the weather conditions associated with a coastal location. Micheal’s father, Frank, started the family business back in the early 1960’s and soon developed a reputation locally as a hard working, conscientious and reliable builder. If you wanted a job done properly, Frank was the man. Today, Micheal maintains the same tradition. Equipment, techniques and regulations may have changed – but the same qualities that clients relied on Gallagher Builders for back then, apply today. Any successful building project is a joint effort. Get Gallagher Builders on the team and we'll get your job off to a sprint start - and a winning finish. What kind of building projects do we undertake? Gallagher Builders Donegal has experience in a wide range of building and construction projects - including (but not restricted to) domestic renovations, extensions, loft conversions, garages and new-builds, property maintenance and landscaping. How are building costs estimated? All our project work for client is costed up ion a job by job basis - depending on the nature of the work, this may be in conjunction with an independent architect or quantity surveyor. We will then agree up front on a payment plan to suit your budget. We are experienced, trustworthy and hard working. We rely on our reputation for most of our work so we strive to do the best job for all of our clients - large or small. We are always happy to refer prospective clients to previous customers and examples of our work (just some of which is overviewed in the "Our Work" section of this website. We are regularly asked by local architects to tender for work - established partnerships that rely on directing their clients to builders they can trust. Subject to your budget, we strive to source the best materials for the job and use local / Irish companies where possible. We are fully insured and are diligent in working to the best Health & Safety practices. We deliver on time - and on budget. Where does Gallagher Builders operate? As we're based just outside Donegal Town, it's no surprise that the bulk of our work is in the County. We've also worked in Leitrim, Sligo and across the border in Northern Ireland. If you're planning a construction project in this region please get in touch to discuss your project. This was a big project for all of us – transforming what was as a treasured but ageing family farmhouse into a modern home. Micheal was very patient as we explored various options and came up with some practical solutions when we had questions about the right materials for the job. His local knowledge meant we could trust the various suppliers so that deliveries on site were on time and hassle free. He completed the work ahead of schedule and we’re delighted with the end result. Where possible, we use local companies who partner with us for the supply of building materials & any services sub-contracted to our projects. Our longstanding relationships with these companies translate into great service and quality work for our clients.